Donald Trump with Florida lawmakers. The White House is reportedly considering plans to auction off Florida’s coastal waters to search for oil and natural gas. But that may be a hard sell in the Sunshine state. Offshore drilling is deeply unpopular in Florida, among both the general public and lawmakers. Even Republicans have warned it could cost the president support in a state that less than six months ago approved a constitutional amendment banning the practice in state waters. Meanwhile, the oil and gas industry is eagerly awaiting the release of a five-year plan taking shape inside the Department of the Interior to open federally owned waters off Florida’s Gulf Coast and the Atlantic Coast for drilling. David R. Mica, the Executive Director of The Florida Petroleum Council, said Friday that the state oil and gas industry has been working with the Department on the plan. He stressed that improvements in technology have made drilling safer in recent years. Offshore drilling is broadly unpopular in Florida, where residents and lawmakers cite pristine coastlines, tourist economies and an already fragile environment for reasons to oppose the practice. Many have vivid memories of the 2010 Deepwater Horizon oil disaster. Others say the state and federal government should be investing in renewable energy sources. A Quinnipiac University poll of Florida voters released March 13 showed 64 percent oppose the practice. Early last year, the Trump Administration announced it would open up federal coastal waters for new oil and natural gas drilling. Criticism from Florida was swift. Republican Senator Marco Rubio and then-Senator Bill Nelson, a Democrat, opposed the plan, along with a bipartisan group of Florida’s House members. Within days, then-Interior Secretary Ryan Zinke changed his mind, declaring that Florida was “obviously unique” and said drilling in Florida was a no go. In what was seen by many as a political move to get then-Gov. Rick Scott elected to the U.S. Senate, Zinke gave credit for that decision to Scott. Scott won his Senate race narrowly. But despite Zinke's announcement, it was never made official that Florida would be excluded from efforts to expand the search for fossil fuels. Last week, the Senate confirmed David Bernhardt as the next Secretary of the Interior. He has been working on the plan for expanded exploration “for over a year,” Colman said. The draft plan is expected to be released soon to the public and will be followed by a comment period. Floridians are likely to oppose the administration's plan. In November, Florida voters overwhelmingly approved Amendment 9, which banned drilling in state-controlled waters. Those waters stretch three miles off the Atlantic Coast and about nine off the Gulf of Mexico side. Even Gov. Ron DeSantis, a Trump ally, signed an executive order in January committing the state’s Department of Environmental Protection to “adamantly oppose all off-shore oil and gas activities off every coast in Florida and hydraulic fracturing in Florida.” That executive order also mandated a number of other environmental measures, including $2.5 billion over the next four years for Everglades restoration and the appointment of a Chief Science Officer for Florida. Jackie Flynn Mogensen, an Assistant Editor at Mother Jones, said on The Florida Roundup that DeSantis' environmental actions thus far have "shocked" some people. “They weren’t expecting this to come from him,” she said. "I think he’s an opportunist a little bit in that way. He recognized that this was issue important to Floridians during the campaign, especially with red ride. It was an issue right at the forefront of voters’ minds and he jumped on that from the beginning." 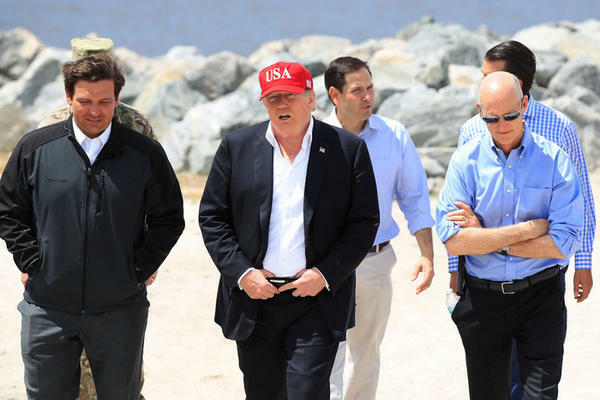 It remains to be seen how DeSantis might impact Trump’s decision to pursue offshore drilling in Florida -- especially given next year's presidential election. Trump won Florida in 2016 by just over one percentage point.